I could feel her excitement when I read Loria’s text message. In a hurry, I grabbed my camera, left my meeting, and rushed off to be by her side. I managed to throw in a quick call to my meeting—aching to be in the treatment ward. 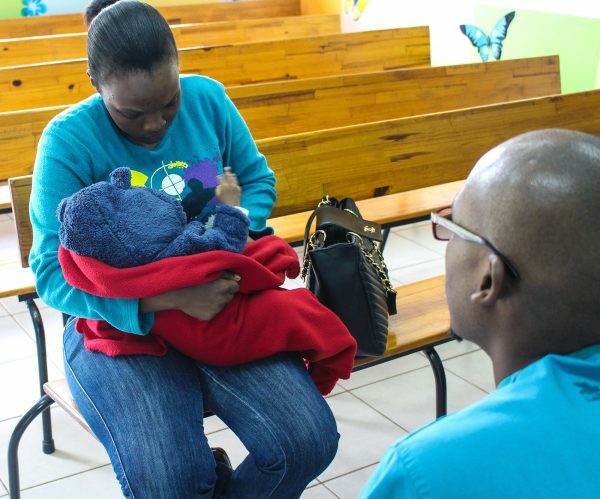 We were having a planning meeting and were discussing how best to efficiently serve women like Loria: mothers whose babies were born with clubfoot. “Go, run! Go see your patient!” Linda, our Regional Director, urged. Without hesitation, I stood up and excused myself. I was followed closely by Scott, our Operations Director, who happened to be in the meeting. Loria holds her son Jaden during their first hospital visit. Scott lives in the USA. He has received countless emails and reports regarding our many programs. 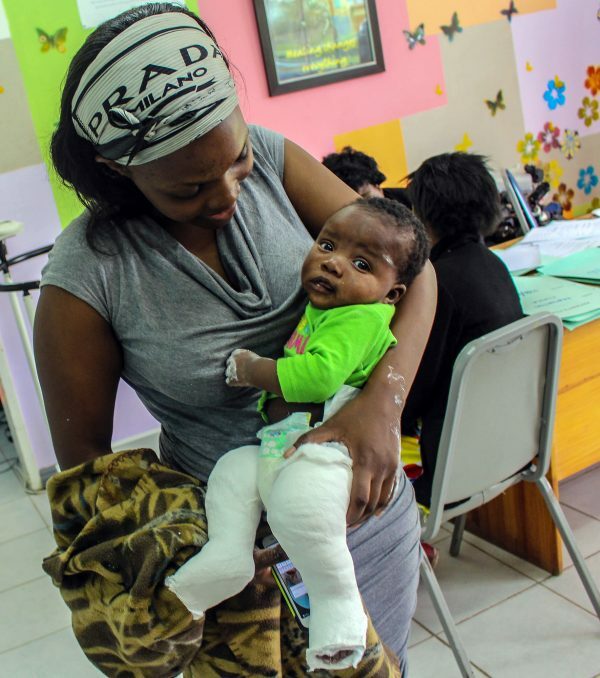 He has also read most of the patient stories we send him and speaks on behalf of all the CURE Clubfoot programs. This time he was going to watch a story unfold in front of his eyes. He was going to be a part of the story! As we hurriedly made our way to the Outpatient Department of the hospital, I took the time to fill Scott in on what was happening. 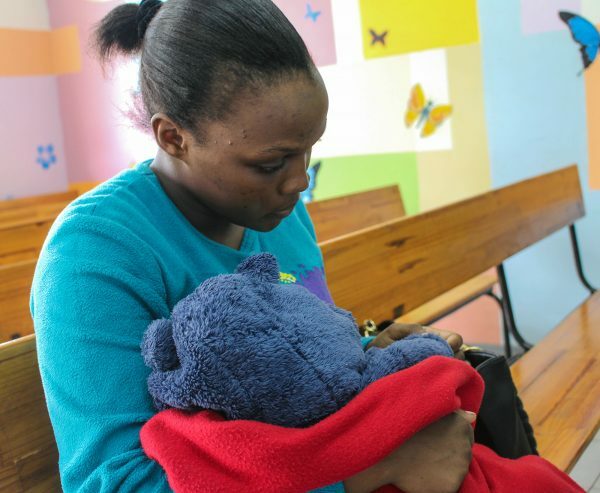 Loria contacted us after she gave birth to her baby. She sent us a message on Facebook. She was worried and not sure what to do. 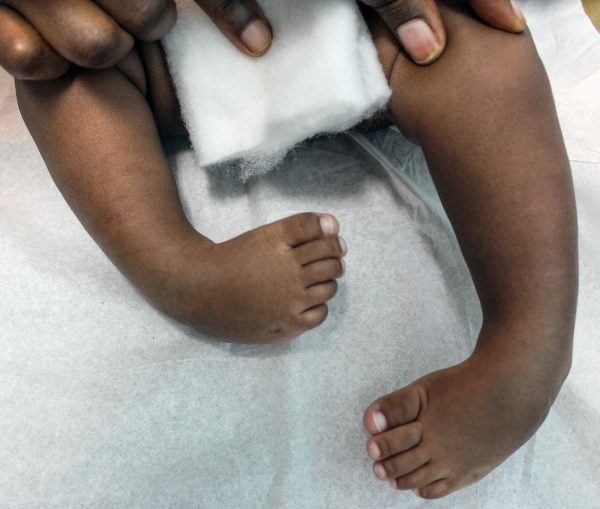 She had just given birth to a boy, and he was born with bilateral clubfoot, which is something she learned about in the hospital. 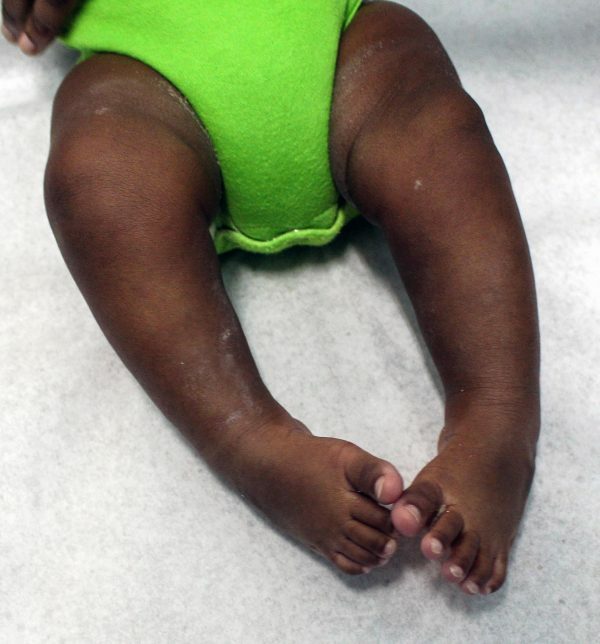 No one in her family had clubfoot, and like every mother, she was worried about her baby having a disability. She had reached out to the right people. In no time, we were messaging her back. 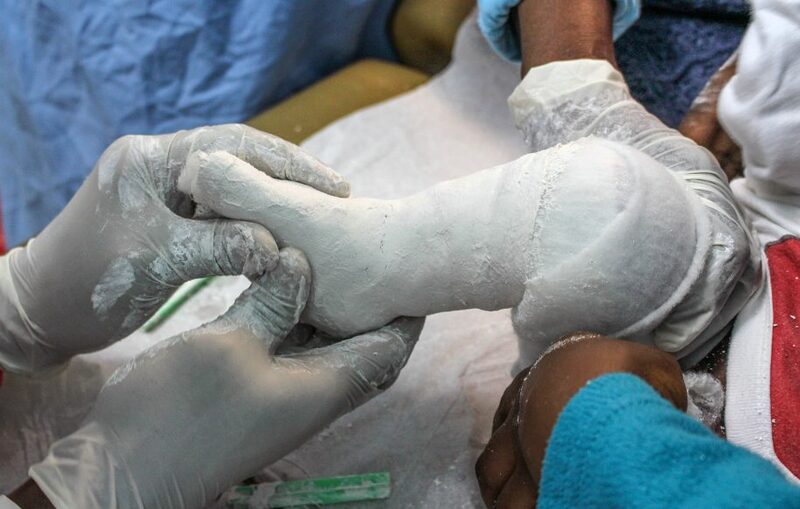 We explained that we understood clubfoot, and that we were available to meet and assist women like her. We had a solution for her! This was welcome news! Loria asked whether she should come to the hospital ASAP. “No ma’am. You just had a baby! Rest and just love that baby for now! Congratulations, and we cannot wait to meet you,” I told her. Due to the holiday season, Loria could not come and get treatment because the hospital was closed. Weeks went by and the hospital was buzzing with new cases and patients. Ian talks to Loria about what will happen during treatment. People always say Zambians are related in one way or the other. This proved to be true when I noticed Loria’s name pop up on a friend’s Facebook page. I reached out to her, abandoning my work pseudonym, and stated that I was the avatar constantly messaging her. Turns out, she was related to a close friend of mine. This seemed to make our conversations much easier! Facebook messages turned to phone messages and voice notes. On a random day, I sent another message to Loria. Hey, just wondering whether you have already started treatment at our hospital? We haven’t. We start tomorrow! I jumped up and down in my seat because I felt so involved in this little boy’s life. I asked her to call me as soon as they walked into the hospital. We will be early! Before the hospital even opens…lol. 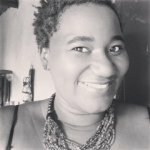 Loria stayed true to her word, and she was in the hospital by 7.30 the next morning. In her arms, was the big man of the moment: Jaden! He was wearing the most adorable baby coat and he had his head covered in a hoodie with bear ears to match. First encounters are usually awkward, regardless of how much time you have spent behind your computer texting away. Loria held Jaden close to her chest. I noticed that her hands held on a little too tight—in a defensive hold. She appeared calm, but her eyes were wide open; she was looking at everything in the room. In walked Ian, our physiotherapist who was working that day. “A new baby,” he beamed looking at Loria and Jaden. “Welcome to our hospital. Hey, little buddy,” Ian said, walking over to Jaden and grabbing one of his little feet. In blue scrubs, Ian sat across from Loria and started the compulsory descriptions of what would happen. I sat next to Loria and Jaden, listening in to what they were being told. Loria, Ian, and I were all in the same age range. Having worked with Ian for some time, he and I had a very good working relationship. We knew just how to treat each and every one of our patients. We decided to relax and have a nice, calming talk with Loria. We chose the route of friendship and peers; encouraging and showing her that we really knew what we were doing; that we were people her age who genuinely understood her predicament. We were looking forward to helping her overcome her fears. That was how our first encounter with Loria went: full of jokes and affection while remembering to share the most important information with her. It was not Loria who asked the question. I felt she wanted to ask the question, but was unsure how to inquire. She gave me a look, which confirmed that I was right. Ian was quick to answer with a very honest reply. “Results vary Loria,” Ian said. “What is important is that you follow everything we tell you about the care plan and treatment. Do not miss appointments. You have to be the strength to your baby for the next few weeks and years until he is able to walk on his own. It takes ‘baby steps’.” He could not resist with the pun! 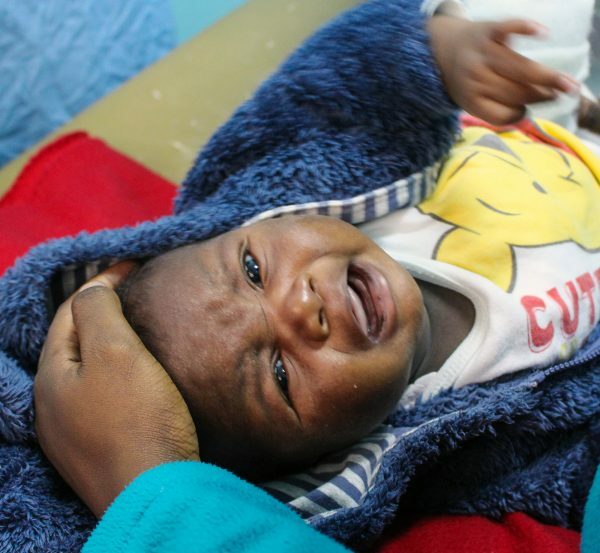 Jaden cries during his first clubfoot treatment. 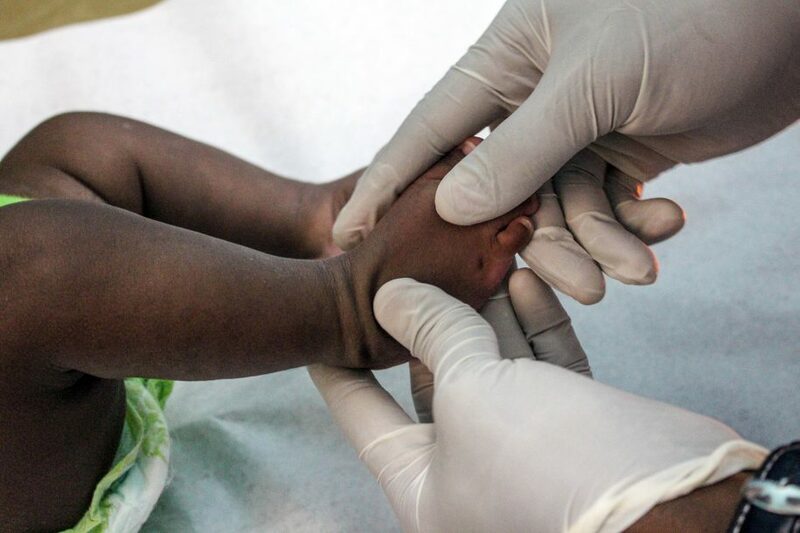 To answer her, I grabbed my laptop and showed her photos of children in Malawi who were born with clubfoot, but were now playing soccer and taking part in physically demanding sports. With Loria relaxed and assured, Jaden got scored and assessed. He had his first casts put on! He cried a lot and was uncomfortable, but we were there encouraging Loria to whisper to her baby and say nice things to him while we put the cast on. In a matter of minutes, it was over and we were bidding farewell to Loria and encouraging her to come the next week at the same time! This was where we were with Scott: rushing to see baby Jaden and his amazing mother, Loria, who made it to the hospital on time. We found her seated, waiting for Ian to begin casting. I looked at Jaden’s feet and saw that his little feet had indeed changed. It had been just a week, but we could see the difference! I went through my camera and showed Scott a before picture of Jaden’s feet to keep him up-to-date and gave Ian a “hurry-up sign” so we could see part two of casting! Ian assesses and scores Jaden’s feet. We found ourselves in one tiny, little room where Jaden was going to get his second casts. Ian went on to score Jaden before the new casts were placed. This is very important so we know exactly how well Jaden is responding to treatment. I peeked at the sheet and saw some “zeros” on his score sheet. Jaden’s feet after his first cast was removed. I could not keep still and my excitement showed to Loria who also beamed, much more confident and happy that things were going well. We did the cast, and saw Scott peeking at the progress as well. He also seemed happy and impressed! There is nothing better than seeing a treatment first hand and realizing that we were watching something amazing transpire. In our own small way, we were part of the story! Click, click, click! I took pictures as all this happened and felt so happy that all was going well and everyone was okay! Jaden gets his second casts! After Ian was done, we all looked at Jaden on the treatment table and gave little sighs. We were happy, and progress was being made! We do not know what awaits us for next time, but in a world of social media and friendship, we are assured that one little boy will get a whole lot of care and love from a mother who loves him to bits!